One of the most exciting community projects undertaken in 2015 was the Nyimili Project (Stage 2). The Nyimili Project was instigated as a result of the Yinhawangka Community expressing their concern about the potential impact of mining and development on Nyimili and the associated range. 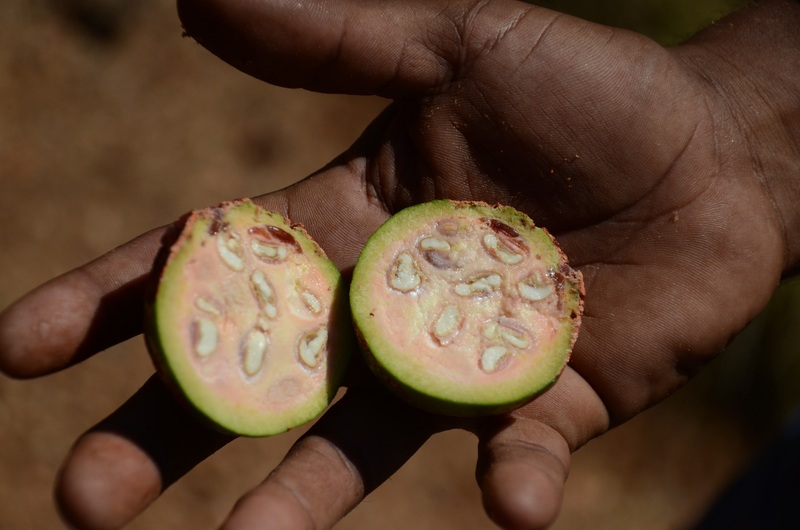 Nyimili is considered to be of outstanding cultural significance to the Yinhawangka people and surrounding groups. There are a number of highly significant mythological places within the range including Nyimili, Jarrurdu and a number of birth and burial places. 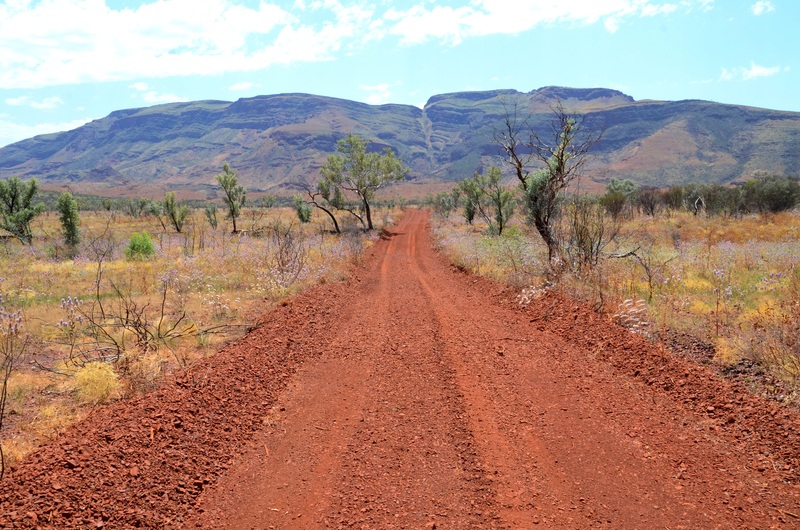 Jarrurdu in particular is a node in a songline that travels all the way out to the Western Desert and connects Nyimili and the range into a much broader cultural landscape. The Yinhawangka people feel a cultural responsibility to protect Nyimili and the range for current and future generations. The project has brought together Traditional Owners who hold knowledge about the area to record stories and sites, engage in cultural activities and to identify strategies to protect and manage the heritage of Nyimili and the range. Stage 2 of the project focussed on relocating highly significant cultural sites that are currently registered with the Department of Aboriginal Affairs, identifying suitable areas to systematically survey for heritage values and conducting a preliminary environmental survey with the recording panoramas and other media to build upon the interactive map that was developed as a result of Stage 1 of the project. The field work for the project took place between September and November 2015. The participants were Yinhawangka people and invited participants, along with anthropologists and archaeologists from Terra Rosa Consulting. During the field work the team relocated two previously known heritage places and identified 90 newly recorded places including scar trees, rockshelters, ochre sources, grinding patches, walled niches, engravings, paintings and storage places. 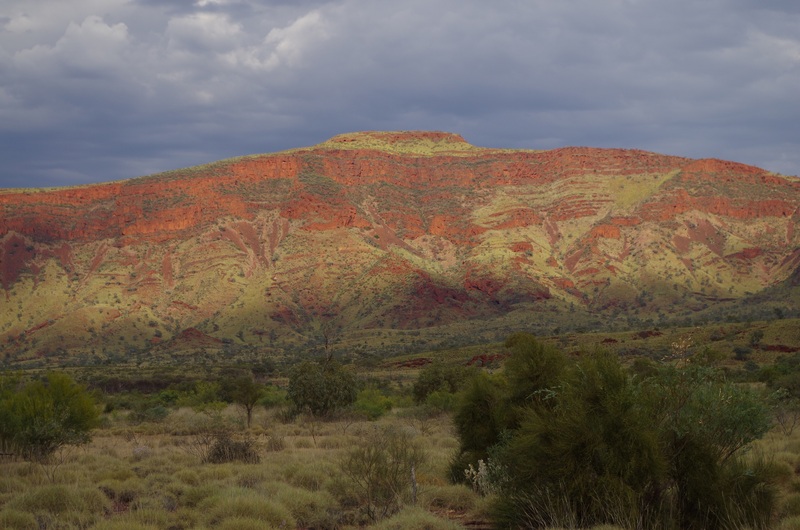 A large number of ethnographically significant flora, fauna and natural resources such as bush foods and Spinifex resin were also identified across the range. During the course of the investigations a number of associated rockshelters were discovered containing extremely rare wooden artefacts. These included a yandi dish, mirrudu (baby carrier), shield fragment, a women’s fighting stick, a headdress fragment, prepared wood for manufacturing spears and cached wood that had been transported into the shelters for future use. These objects are of outstanding cultural and archaeological significance and members of the Yinhawangka community continue to make these artefacts today. 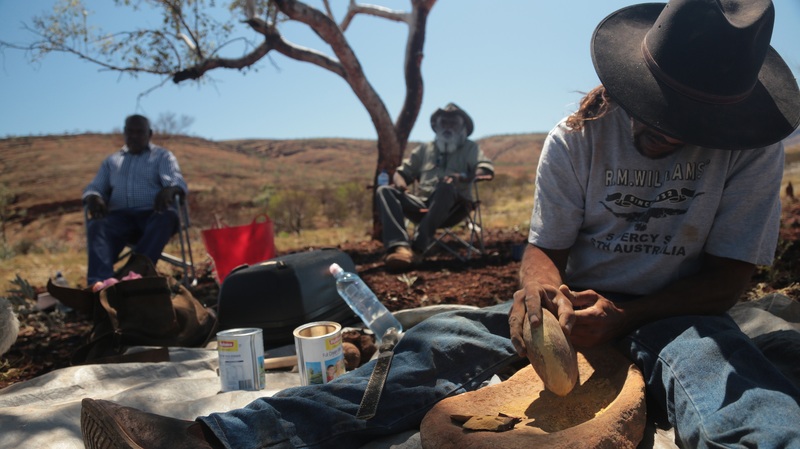 Clinton Cooke preparing ochre. David Cox and Claude Cox in the background. During two of the field trips Claire Leach, an independent director of photography specialising in anthropological film making joined the team. Claire recorded the range, many of the sites and invaluable ethnographic information about the sites and stories associated with the place. These videos will play an important role in telling the story of the place. One of the main outcomes of the project is the development of an interactive map that will act as a repository for the information collected during stages 1 and 2 of the project. The map will also allow people to take a virtual tour of Nyimili and the range where they can view panoramas of the landscape and sites, along with photographs and videos which will help to communicate the cultural values and story of the place to current and future generations. 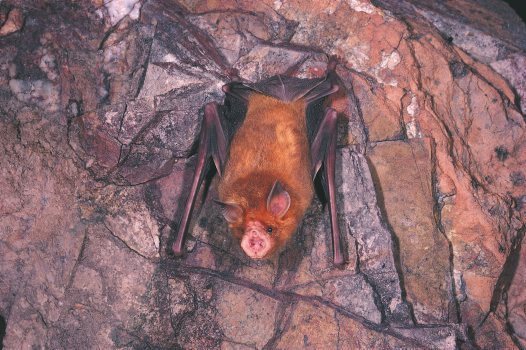 During the preliminary environmental survey the Pilbara Orange Leaf-nosed bat was identified at several sites throughout the range. These bats are a significant species that are listed as vulnerable under the ‘Environment Protection and Biodiversity Conservation (EPBC) Act’, and ‘Rare or likely to become extinct’ under Schedule 1 of the WA Wildlife Conservation Act (Specially Protected Fauna) Notice 2014 (WA WC Act). Future directions for the project include investigating a different gorge system which is likely to be highly productive, relocating an additional rock-art site, investigating new target areas around the range and undertaking excavations at a couple of the rockshelters that have a very high potential for sub-surface cultural material. These excavations may also uncover dateable materials which can begin to provide a temporal framework for the occupation of the range. Terra Rosa would like to thank the Yinhawangka Aboriginal Corporation, Claire Leach and all of the Yinhawangka Traditional Owners and invited participants who undertook the fieldwork and provided cultural information.